Throughout the Middle Ages, Christians were fascinated by stories about saints, who led extraordinary lives full of mystical events and miraculous occurrences. Saints were depicted in manuscripts experiencing revelatory visions and performing wondrous feats such as healing the sick or raising the dead. Even when their tormentors were performing exceptionally brutal acts—shooting them repeatedly with arrows, for example, or violently beheading them—martyr saints were pictured remaining steadfast in their faith. 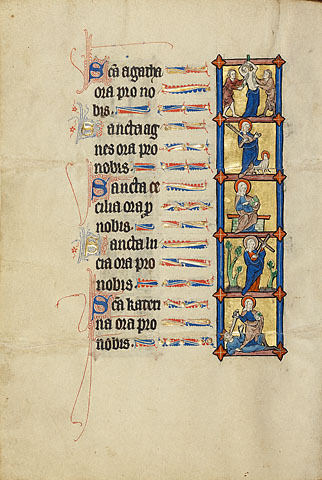 This exhibition, drawn from the Getty Museum’s permanent collection, presents manuscripts that allowed medieval viewers to witness these dramatic narratives and venerate the saints as models of piety. This entry was posted in Exhibitions and tagged Charlemagne, Christian, christianity, history, J. Paul Getty Museum, Middle Ages, Saint on December 31, 2013 by mariaalessiarossi.